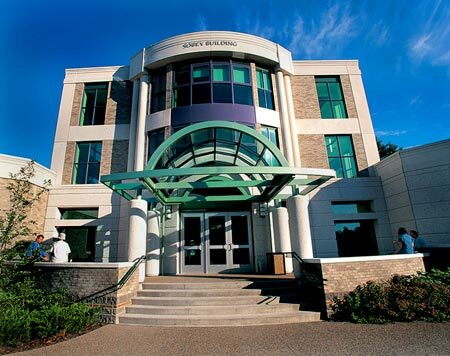 By car, the most popular route to King's College is from the north and from the Halifax International Airport, along Route 102 (Bicentennial Drive), which brings you into downtown Halifax via Bayers Road. If you're coming from the United States, you can reach Nova Scotia by driving through New Brunswick. Halifax International Airport, a modern and convivial airport (map) has daily arrivals from many North American and European cities. The airport is approximately a 20-minute drive from the King's campus. Car rentals, taxis and limousines, and the cheaper and convenient Airporter shuttle service ($19 one-way) can be used to get from the airport to Halifax peninsula where the University is located. Travellers with special needs will also find accessible local transportation. There is now a new accessible city bus route (bus 320) with limited stops between the airport and downtown Halifax (Albermale Street) (Cash fare: Adults: $3.25; Children/Senior: $2.50. Upon boarding the airport bus, you may ask for a $1.00 transfer that will give you access to other city buses for the next 90 min.). On weekdays during peak hours (betwen 5:45 a.m.-9:00 a.m. and 3:00 p.m.-6:00 p.m.), the bus departs from the airport every 30 minutes. It departs from the airport only once every hour for off peak hours and on weekends (see schedule). Note that you can only take carry-on luggage on the city bus. Please check with the Alexandra Hall residence front desk concerning availability of temporary parking passes for on-campus parking. Call just prior to your arrival ((902)422-1271), or visit the reception desk in-person, located inside the front door of Alexandra Hall. If on-campus parking is unavailable, you may park on the streets surrounding the campus (ask our staff for advice for free, long-time street parking!) or in the paying parking lots surrounding King's.